Egg salad may be the least photogenic salad in the universe. I tried to get all artsy with it. But it still looked like sewage. So this post will have no picture of the yumminess. But I felt the picture of Duke's would suffice, because using the best mayo you can get your hands on is essential. Egg salad really only has 2 ingredients: eggs and mayo. Everything else is just window dressing. So you need to get the best eggs and the best mayo you can. I am an egg snob. I am fortunate enough to live about 10 minutes away from Osage Organic Farm which sells organic, free range eggs. I can even go and spend time with the chickens if I want to. Most of the time I don't, but I could. I think organic, cruelty free eggs are important. End of sermon. 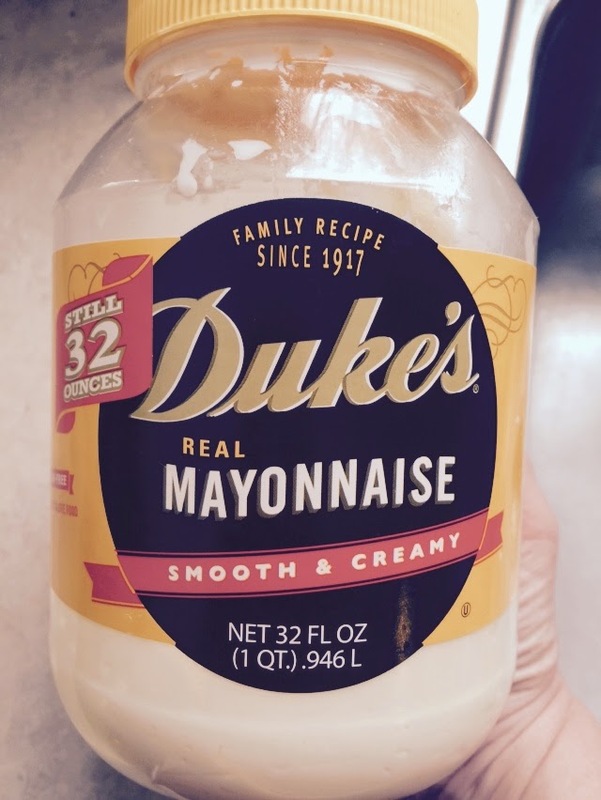 I've written in another post about my fanaticism when it comes to Duke's mayo. I've smuggled gallons of this stuff out of the South. As far as variations on this recipe, there are untold millions. The number of eggs you use determines how many you can feed. Four eggs usually makes enough for me to last for 2 days if I eat the salad on crackers. And I really don't want to get into methods of boiling and peeling eggs. I've spent many hours cussing over a sinkful of eggs that wouldn't peel worth a darn. Now I usually put the eggs in a saucepan and add water to cover- and add a splash of vinegar. I bring the eggs and water to a fast boil, turn the burner off and set a timer for 20 minutes. After that, I dump them in the sink and run cold water over them for a few seconds, then peel. Sometimes it works, sometimes it doesn't. Life is uncertain. Here's the basic recipe. Take it and run with it. Put everything in a bowl and mash it up with a fork. Then make a really good sandwich, or eat it on Wasa Crackers.